See. Touch. Wow!!!! Just imagine merging the physical and digital characteristics together in one product display! This product is for you. Original content scanned and documented that requires a twenty-first century display method to present this material to do it justice. Introducing the MagicBox. This innovative display cabinet displays original and animated content in a fascinating new way. Print publications are usually limited to a look-only display. With this product, these items can be fully tangible at the fingertips of the audience. Physical objects can be combined with video or interactive 3D renderings to enhance the understanding of their functionality. The MagicBox enriches exhibitions not only with additional information, but by making them a truly memorable experience. 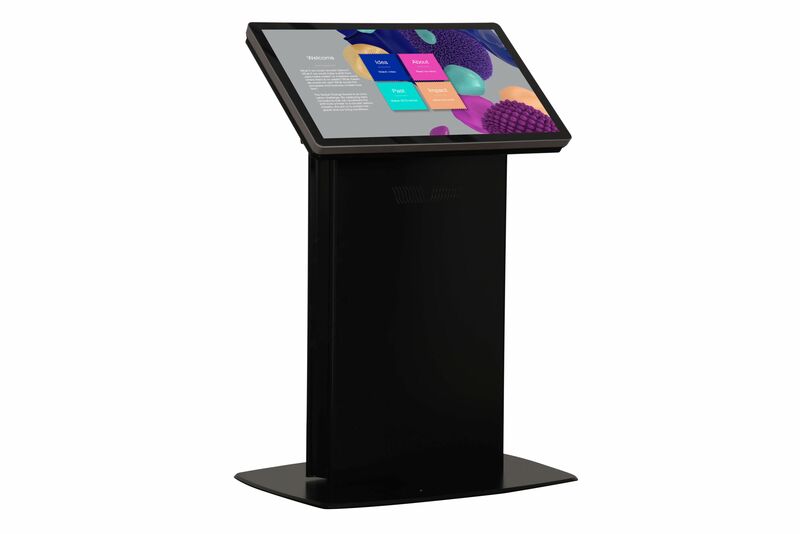 The MagicBox is a complete display with pedestal and case where the MagicTouch Kiosk is a large touchscreen monitor with pedestal without the display case. Don't need a cabinet but are looking for an interactive presentation, then the MagicTouch Kiosk is a wonderful option. Some people say it's magic! The MagicBox consists of an innovative display cabinet that merges the physical and the digital. This combination creates a fascinating method of presenting original and animated context. A two dimensional exhibit is transformed into a 3 dimensional rendered exhibit. Physical content can be combined with video and interactive 3 dimensional renderings to enhance the understanding and functionality of the exhibit. 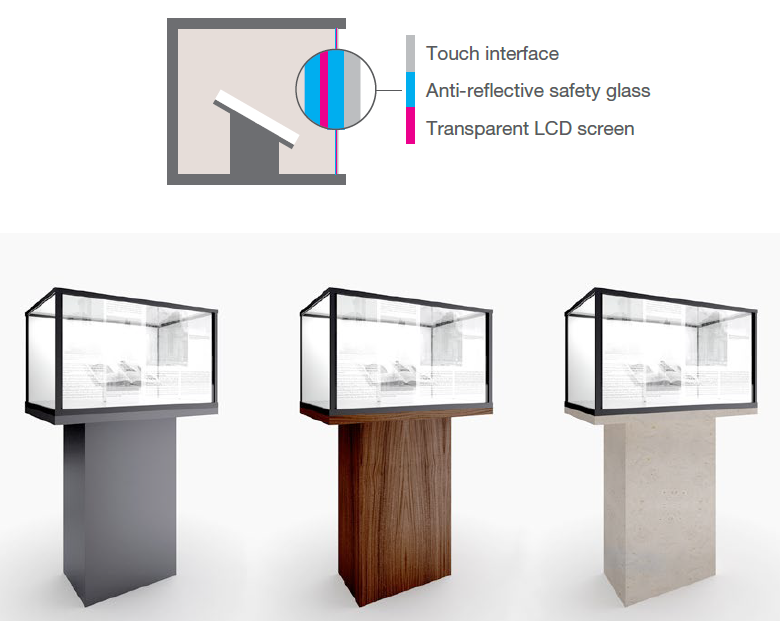 The MagicBox system combines an interactive transparent LCD touch screen, a fashionable standalone pedestal, with exceptional custom software to transform your exhibit into a 21st century interactive presentation. A combination of state-of-the-art hardware and software makes it possible to superimpose digital images, videos, and 3D models on the exhibited object while keeping the same object visible at the same time. With this technology, visitors are able to control and interact with the exhibit their way and in such detail that has never been seen before. MagicBox includes a 47" display case with interactive transparent screen, infrared frame, PC, and MagicTouch Software. A premium edition is available which includes an upgraded display cabinet. Who can benefit from the MagicBox? Architects, developers, engineers, interior designers and others involved in the creation of new structures. Where would I use the MagicBox? Museums, libraries, trade shows, zoos & aquariums, universities, office buildings, hospitals, shopping malls, conference centers and other indoor spaces just to name a few. MagicTouch Kiosk was developed in concert with MagicBox. MagicTouch Kiosk is similar to the Magic Box in that there is a display platform running the MagicTouch software. Easy to use, exhibitions and digital signage configurations can be easily created and edited by in-house staff. A perfect solution for museums, airports, schools, libraries, and other public places. MagicTouch is the software application that drives the hardware for MagicBox and MagicTouch Kiosk. MagicTouch is a comprehensive management software that lets the end-user easily create stunning multimedia presentations. Exhibitions and digital signage installations can be freely edited by in-house technical staff. MagicTouch is scalable. Licences can be purchased in 1, 5, 20 even 50 seat licenses.